Home » » Why Are They Blue? 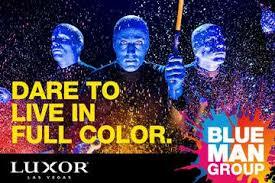 Only in Las Vegas would you find a group of hairless and non-speaking guys that are blue. 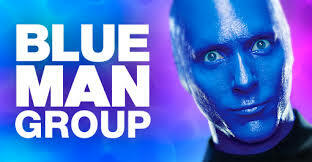 The Blue Man Group is really a fantastic show. They use PVC pipe as their drums, beat on drums that are filled with milk or paint, and their facial expressions throughout the performance tell the story perfectly. A branch off the Cirque du Soleil circuit in New York, these guys slipped through the side door. But this is no repeat of Cirque du Soleil. There are no acrobatics or aerial maneuvers in this show. 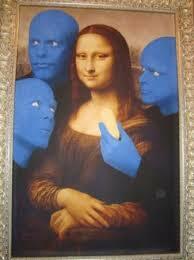 There are just three blue guys making lots of noise and sometimes a lot of messes. It doesn't sound very Vegas, but it is just another end of the color spectrum that is also used by Cirque du Soleil. They wrap themselves up in a blue suit and then paint their faces and hands blue. They don't talk at all during the hour and half shows, but you can see in their expressions and eye what they are trying to get you to see or do. They also let audience members in on the fun. They will choose a volunteer and take them on stage to beat the drums or pipes, and during some shows they encase the volunteer in a cocoon and then paint it blue. 4.7 million feet of streamers, which create a festive atmosphere. They do perform for minor audiences. At the Autodesk convention in November of 2006, they did a show at the Venetian for about 8,000 attendees. Most of these people came out of the show saying how good it really was. Usually by the end of the show, the audience is roaring with laughter and amazement. Well worth the ticket price to see and you will most certainly be scratching you head in wonder as you are leaving.